The elegant five button arrangement allows MusiQ to be operated with same simplicity as the KMM keypad: zone on & off, volume up & down and control of the source components (CD track, skip, disc skip, tuner station skip). A beautiful - and functional - addition to this popular multi-room system. * Wide angle infra-red transmitter. The MusiQ IS multi-room system now has its own dedicated IR handset, the fabulous new MQR. The elegant five button arrangement allows MusiQ to be operated with the same simplicity as the KMM keypad: Zone on & off, volume up & down and control of the source components (CD track skip, disc skip, tuner station skip). 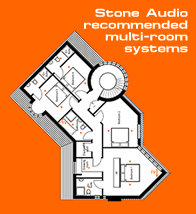 A beautiful - and functional - addition to this popular multi-room system.